I have had an itch to put brush and ink to paper. Today I scratched it. Scratching it didn’t help. It just turned into a rash that looks like Batman. Weird! I called my Dermatologist. He told me that it wasn’t a rash, but a drawing. He also told me that having an itch doesn’t always mean having an itch. That is even weirder than my Batman shaped rash. I think I need a new Dermatologist. About the drawing: This is one of those sketches that I created without even an inkling (sweet pun) of a plan. I had a piece of watercolor paper, a brush and some ink. It is always one helluva party when art supplies and the subconscious get together. You never know who else will show up. Could be a mouse on a mission. Often it is Wolverine. Sometimes it’s David Byrne or a fowl-esque dragon. Today Batman arrived in a dark alley. Helluva party! Start to finish, the sketch probably took 25-30 minutes. It is a mess, as it should be. I didn’t plan a bit of it. The anatomy is a mess. There is no clear light source. Some parts are way over-done (head and face). Others are way under-done (the mist/smoke effect). There are some bits that I really like about it. This is the first time I played with dry-brush on rough cold-press paper as an inking technique. Cool effect. I really like it in the bricks. 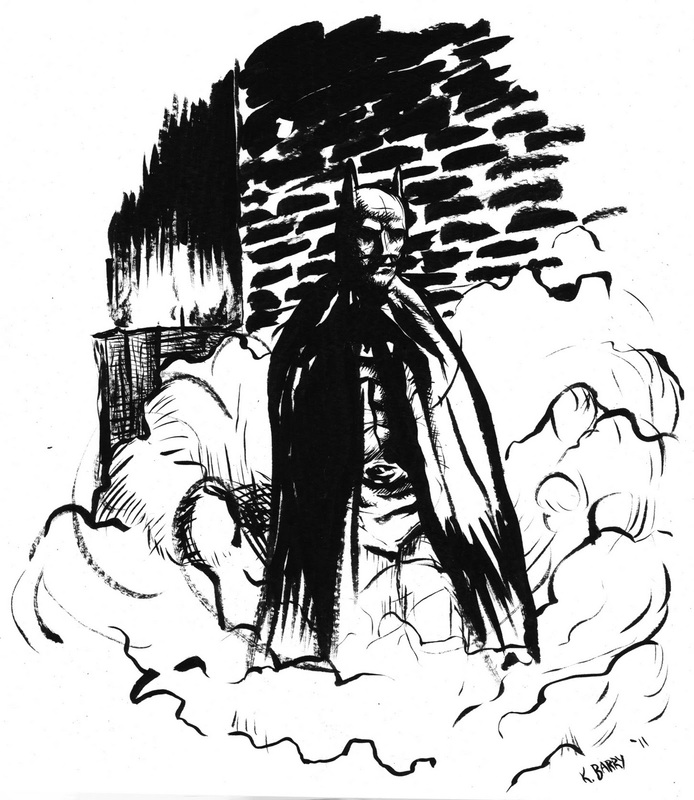 I also enjoy the brushwork in the cape, though I am still trying to suss out what is appealing about it. What I like more than anything else is the smirk on the dark knight’s face. It looks as though he is really going to enjoy whatever punishment he is about to dish out on some punks. Batman as a maniac vigilante always made a lot more sense to me than Batman as a super hero.